Edgecumbe Spreaders owner Dave Warren. Over the course of only a matter of months he’s made a change from the traditional method of using a truck to spread fertiliser, to buying and setting up a JCB fastrac tractor as a spreading unit. 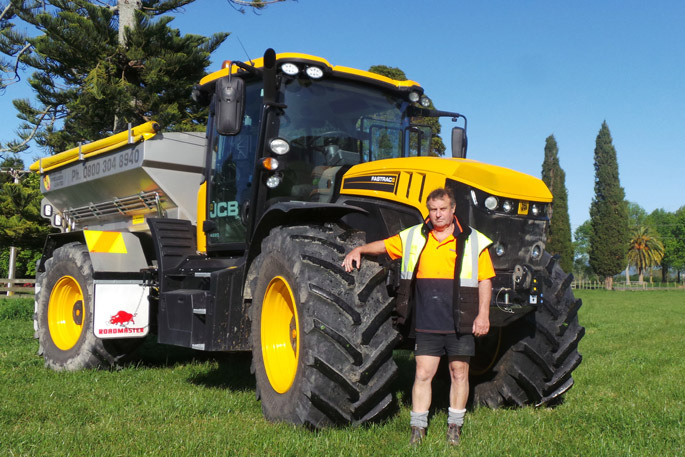 The $400,000 project began for the owner of Edgecumbe Spreaders in May and has finally come to fruition, with the JCB system having been operational for four weeks. It’s a change he says has not only been necessary, but beneficial. “They used to convert these fastracs into spreaders in New Zealand 15 to 20 years ago, then they stopped as four-wheel-drive trucks became more popular. “Operating within the business of spreading fertiliser, we need to be offering farmers the best thing we can and I felt this was a step forward in technological development so we’ve invested into it. The unit was sourced from CLAAS Harvest Centre in Australia, a process Dave says took six weeks from his order date. It’s created a way to extend cash flow for Dave’s business and more importantly, its services to the farmer. “It costs more than a truck, but it’s been more supportive with what we are offering. “There’s a lot of low-lying ground around here and it’s also peat, so the benefit of this unit is it doesn’t make the same mess trucks do. The unit is equipped with the latest technology and a better design including TrackMap software and a bottom chain return bin, designed specifically for organic products. “Traditional bins have a spine through the centre and are quite narrow so while normal fertiliser will flow freely like sugar, chicken manure and bark just sits there and clogs. The wideness of the new bin means the organic product doesn’t bridge like this.